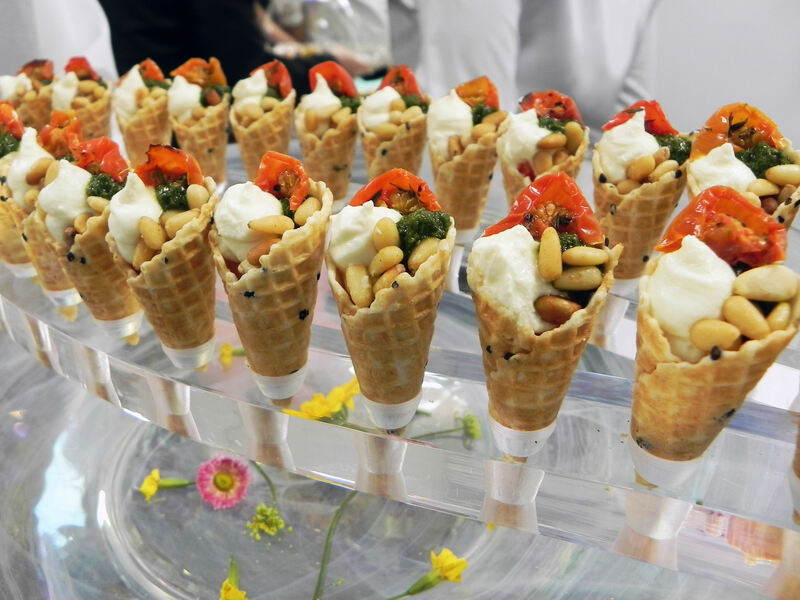 We were delighted by the approach from Wellpleased Events to offer the catering and hospitality at such a prestigious event earlier this year. 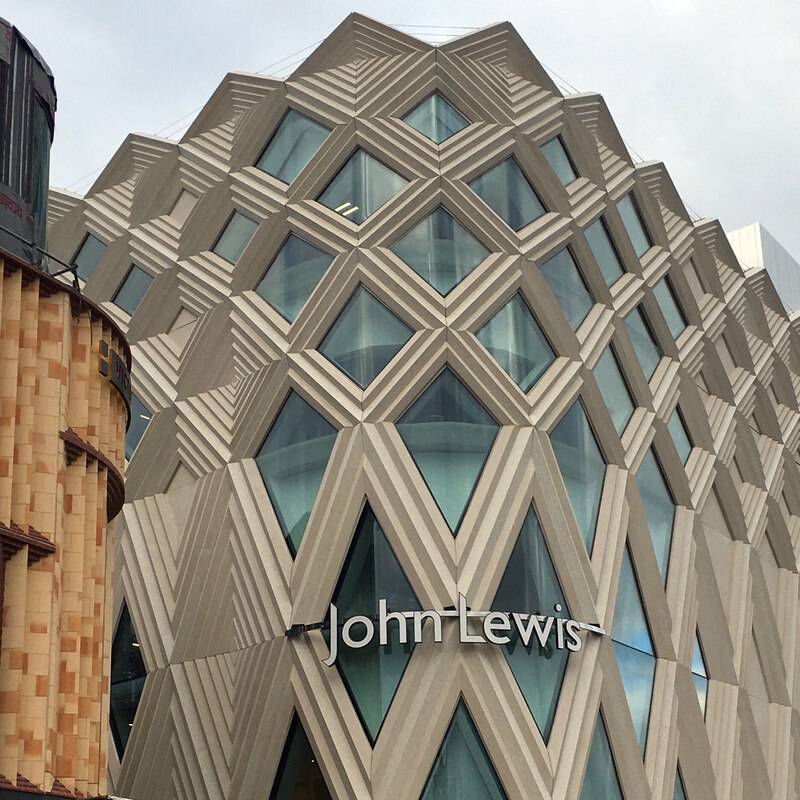 The John Lewis store was everything we imagined and more! Feeling very privileged indeed to be doing the catering for the VIPs, just hours before the store opened to the public the very next morning – we headed up to the 4th floor with our guest passes, sneaking glimpses of the shiny new makeup counters and beautifully merchandised womenswear department. We arrived at Victoria Gate promptly at 4pm for our pre-event briefing and were guided up to the 4th floor of John Lewis through the staff entrance. The beautiful store was already decked out for Christmas shoppers, ready to welcome the eagerly awaiting Leeds folk the following day. Everything was immaculate including the polished floors, so we were extremely cautious when setting up the occasional tables and carrying our equipment. Drinks stations were arranged with crushed velvet table cloths, gleaming glassware and a selection of drinks were positioned in the childrenswear department where the VIP reception was taking place. After the briefing was complete and we were all clear on our roles and responsibilities for the evening, it was time to add the final flourishes. At 6pm our team were in position to greet guests, we also offered a cloakroom service on the evening. Following a brief tour of Victoria Gate, guests entered the John Lewis store and were guided up to the 4th floor around the central atrium, where they were greeted with a selection of drinks to choose from, including Cava, Masons Yorkshire Gin, Elderflower & Ginger Cordial and Mineral Water presented on elegant trays in a selection of John Lewis brand colours… It’s all in the ‘Dine’ detail! Canapé service commenced at 6:45pm, where a selection of Arancini, Mini Cornettos of Caprini Goats Cheese and Tempura King Prawns were served from a combination of quirky and elegant displayware. 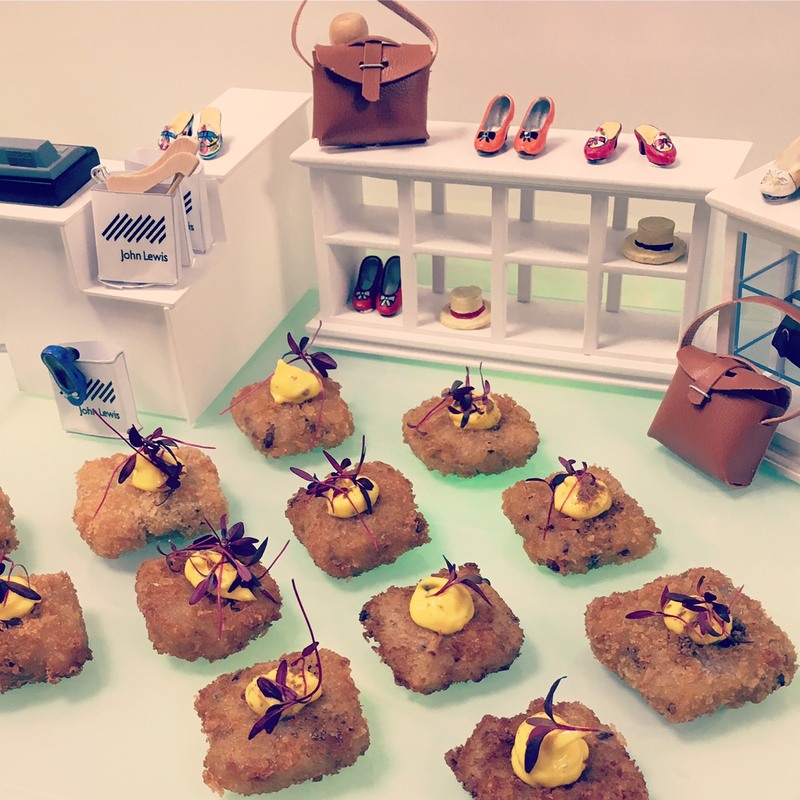 Arancini of Wild Mushrooms with Truffled Aioli, was served on a board which represented a miniature shop floor.. Following a lovely speech by Andy Street, John Lewis CEO, at 7.45pm bowl food and dessert items were offered. 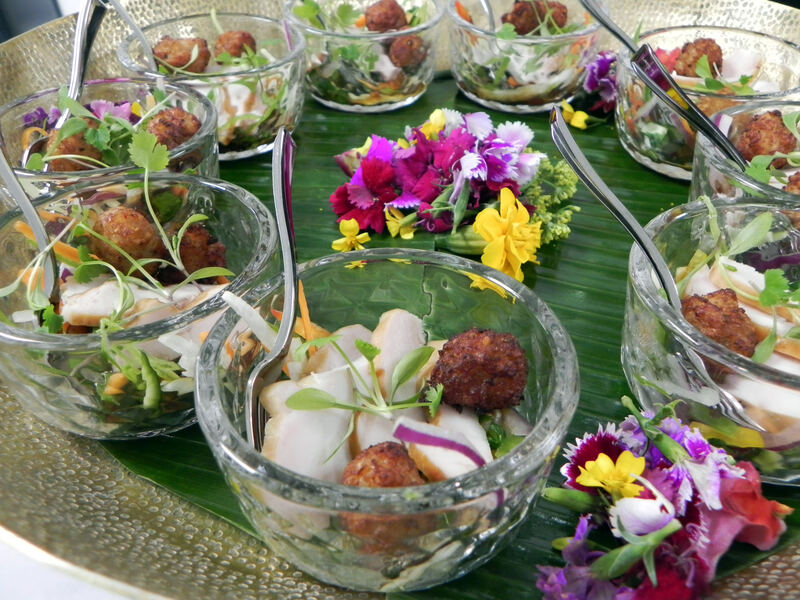 Smoked Chicken Salad with 27 flavour dressing – presented in individual crystal dishes. 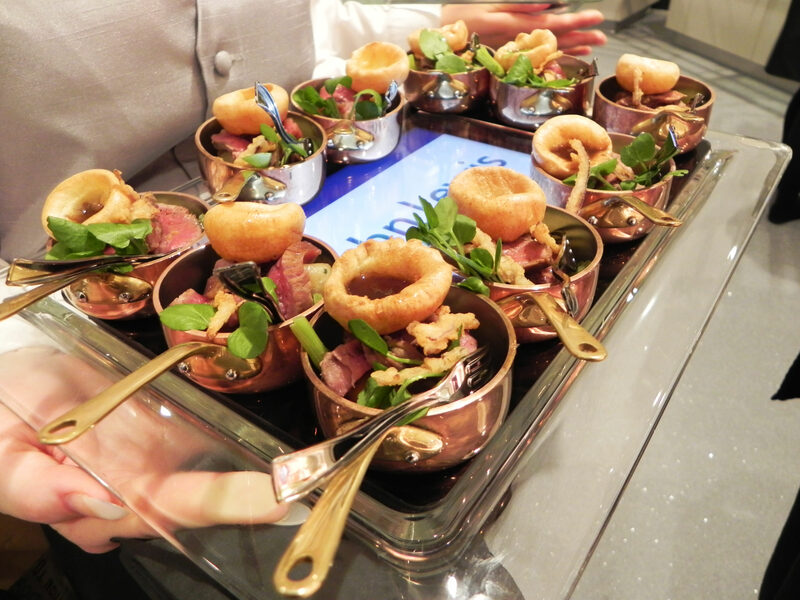 Mini Roast Dinner of Yorkshire Beef; Mini Yorkshire Pudding, Roast Potatoes and Heritage Baby Carrots with Rich Port and Roasted Onion Jus, with a Horseradish Dumpling, Crispy Onions – presented in mini copper pans on our custom iPad trays, which contained a slideshow of images of Victoria Gate. 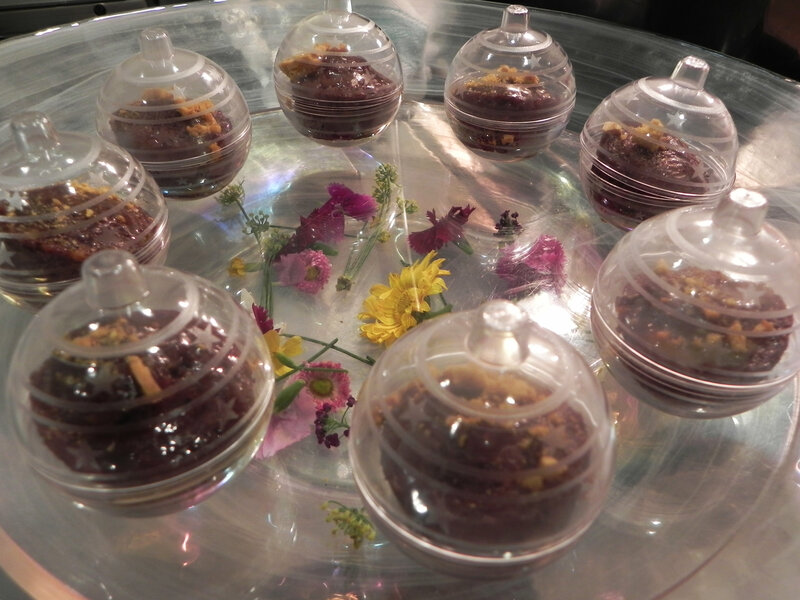 Sticky Toffee Pudding with Yorkshire Toffee Sauce and Honeycomb Brittle – presented in a mini baubles (we do love a hint of Christmas, even in October!). 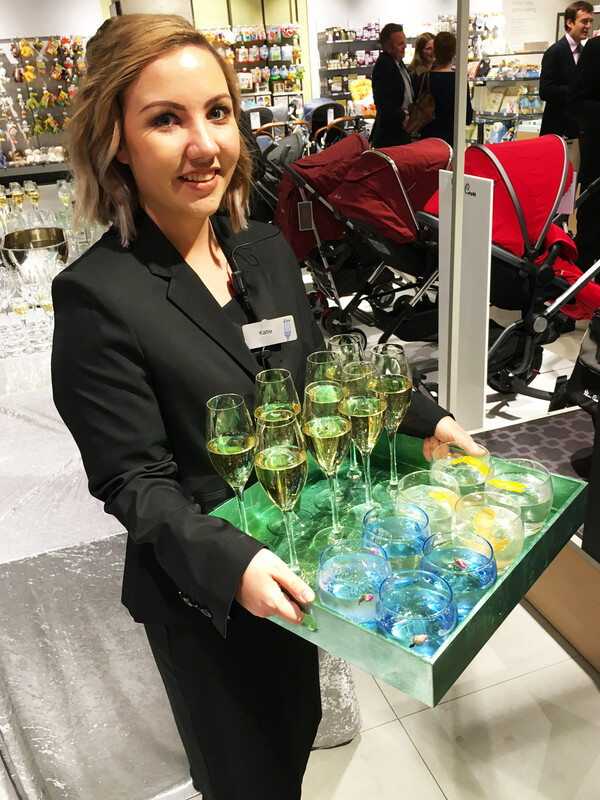 At 8.45pm service of Drinks & Canapés concluded and guests started to depart – having enjoyed a gorgeous evening of VIP hospitality in the largest John Lewis store outside of London. After the guests had left the Dine team packed up, cleaned up, and were out the doors on schedule at 10pm, leaving all areas spotless (we always aim to leave any workspace cleaner than when we arrived). A fantastic evening was had by all.. including us and a great way for us to finish what has been a record year for Dine.